The temperature is only barely reaching over freezing level in parts of Canada. But Dairy Queen nevertheless thinks a cool treat is just what people need right now. 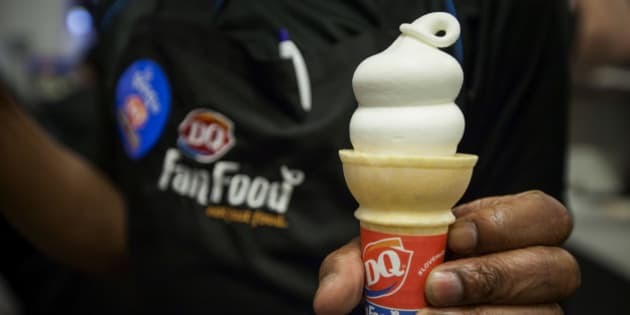 The dessert and fast food franchise will hand out a single small vanilla cone to anyone who walks in the door at its restaurants in Canada and the United States on Free Cone Day (March 16). It's a way for the restaurant chain to celebrate "75 years of the best fans ever." And while we'll never turn down a sweet treat, we can't help but think this MAYBE isn't coming at the best time of year. See, it's been a lousy winter up north and throughout much of the East Coast. And spring doesn't officially start until four days later. Some Canadian cities are still expected to be below freezing on March 16. Halifax is one of them. Fredericton, N.B. is right on the mark that day and Quebec City is only expected to be one degree Celsius above zero.